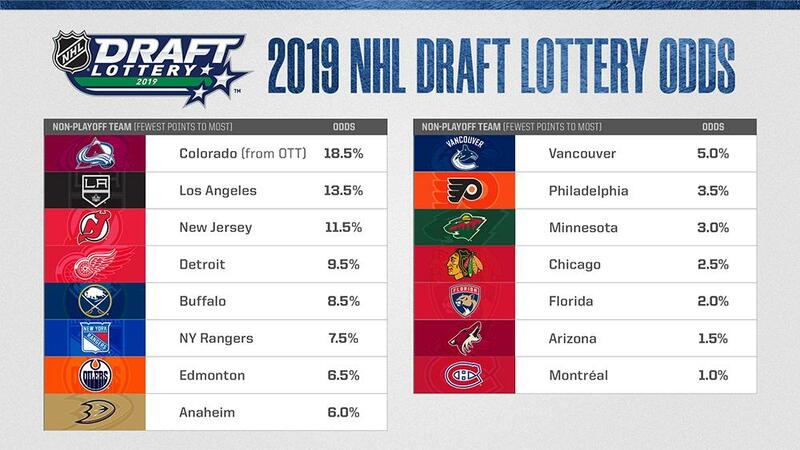 Starting at 8 p.m., the NHL will conduct its annual draft lottery, as the teams that miss the playoffs wait in anticipation to see how high they can move up the draft board. The reveal will come during a one-hour show broadcasted on NBCSN, Sportsnet and TVA Sports. Ken Holland will be in attendance representing the Red Wings. With the Red Wings finishing fourth from last, they have a 9.5 percent chance of moving up to the No. 1 pick. Last year, as the Hockeytown faithful surely remember, the Wings fell from No. 5 to No. 6. Hard to complain when they ended up with Filip Zadina, of course, but it was the second-straight year that they had bad results in the lottery (and they’ve only participated in the lottery twice). In 2017, they ended up with the No. 9 pick after starting in the No. 7 spot based off the standings. Teams can only fall three spots, so the Wings are guaranteed to pick at No. 7 or higher when the 2019 NHL Draft kicks off in Vancouver on June 21. MiHockey will be following along tonight, and we will have a story ready for the potential players the Red Wings could pick, based off where they officially land in the draft lottery.